We bought a house 3 yrs ago that had 3 well established peonies that had been blooming profusely. Last year, however, one of them came up in spring but much smaller than years prior, and it did not produce buds or blooms. It came up again this year but smaller still, with no buds. The foliage is thick and healthy, but the plant is shrinking. It is located near but well spaced from the other 2 which are doing great. Our location is Storm Lake, Iowa in northwestern Iowa. The 3 plants are located in a bed on the south side of our garage and get adequate sunlight. The only difference in the 3 peonies is that the "problem child" had frilly frilly fancy blooms while the other 2 have traditional blooms. What do you think, and what advice can you offer? Thank you! Fortunately, peonies have very few issues. Some peonies are susceptible to blight caused by fungus or bacteria, but those kinds of infections are usually caused or triggered by something else. As you say your plant looks healthy otherwise, so we can rule those out. Other issues can be created when the roots are planted. If they're too deep, or become too deep over time by mulching or hoeing for weeds, this can result in a failure to bloom. There is also something called 'bud blight' in which the buds form but then wither away before they open. Other causes of failure to bloom is too much nitrogen fertilizer - which is my suspicion, as you say the plant looks great, nice and green and healthy. If this sounds like a cause, hold off on any fertilizer this year, in the hopes that it could produce flowers next year. Fertilizer that has a bigger middle number (something like 0:10:0) will encourage winter hardiness and blooming. Frilly blooms on plants sometimes indicates a slightly more fussy type of growth - the plants just aren't as strong as regular robust types. This could cause the plant to be injured by winter cold more than the others. "When a peony’s not blooming, potential causes are many. This is probably the most common peony problem gardeners encounter with this pretty bloomer. Some of the reasons why peonies don’t bloom include simple issues, like plants are too young and still immature. Many peony varieties take three years to produce ample and typical flowers. The other reason many peonies fail to flower is due to deep planting. Eyes on peony tubers should be just below the soil surface—1 to 2 inches (deeper in colder regions). Flower buds can be killed by late freezes, and too-high temperatures can cause the late, fully double peony varieties to fail to flower. Another common reason for peonies not blooming is that plants may not be getting enough light. If peonies are leafy and taller, they may be stretching for light. Check nearby shrubs and trees to determine if peonies are shaded. Heavy nitrogen fertilizer can also be responsible for peonies not blooming. Be careful when planting peonies near lawn areas. Make sure you aren’t over-fertilizing the lawn with nitrogen-rich food. The same is true for peonies growing near shrubs or in other garden areas. 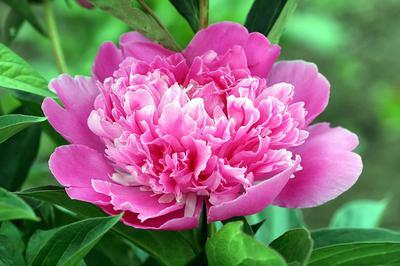 If you apply fertilizer packed with nitrogen, peonies may respond with dark green, super healthy leaves and no flowers." Hopefully, some of this information will be helpful for you - prepare to be patient. It could take several seasons for the conditions which have caused this issue to be corrected. I found this article from one of my favorite garden blogs, A Way to Garden; When your Peony fails to bloom and on the podcast with Ken Druse Garden Q&A.